Exactly what do I get for my money? With such a wide array of products and building methods available, you want to know exactly what type of products will be used in your new home. In order for us to keep costs down through bulk purchasing, we have developed this list of proven building products that we use as standard. Any items on this list can be changed or modified by you, the home owner. Most of the time we find that clients prefer to just focus on the decisions that matter to them and leave all the technical and building related things to us. Plans ready for council (excluding any engineers design and council fees). Very high wind zones and coastal areas may be subject to additional costs. Full builder’s risk insurance whilst under construction. H1.2 90×45 SG8 pine framing wrapped in breathable building wrap. Internal stud height of 2.4m. Colorsteel fascia and continuous spouting with Colorsteel downpipes. 4.5mm fibre cement board. 600mm wide soffits. 450mm gable overhang. 180mm Linea weatherboards above windows and doors on gable ends. Bricks from NZ Brick Distributors including – Hallet, Earth, Heritage, Riverview, Everyday Life and Foundation ranges. Tinted, double glazed, powder coated aluminum windows and doors with powder coated hardware to match. Obscure glass to bathrooms and WC. Single glazing to garage. Standard Latitude front door. Dominator Milano Colorsteel automatic sectional door, with 1 wall remote and 2 key ring remotes. MDF, smooth, hollow-core doors, 1980mm door height. Silage Denvor handles. Door stops. Cavity sliders with steel reinforced doors and flush pull handles. 10mm standard GIB to walls, 13mm GIB to ceilings, Aqualine to bathrooms. 75mm GIB cove, 55mm to cupboards. To a level 4 finish. Exterior to include soffits and Linea (2 colours); interior (3 colours, white base only). We can provide you with a kitchen plan or a prior cost sum to work with our kitchen designer. Westinghouse ceramic cook top PHN768U. Westinghouse multifunction oven POR667S, Westinghouse dishwasher WSF6606X, Robinhood 90cm range hood RWC3CH9SS. Robinhood ½ horse power waste disposal unit with air switch SE390QA. Jameston Standard Bath, 1675×750 with tile surround. Trentworth 1m x 1m square acrylic showers. Bella Wall Vanity, 900 Melamine White to bathroom and en-suite. Conti Wall Vanity (Mini), 400mm Melamine White to W/C, with pop up waste. Alexander heated towel ladder. Stylis Florence toilets, toilet roll holders. Hansa Ecojet New Mono Slide Shower Set. Hansa Polo Concealed Shower Mixers. M&Z Ditirambo High Rise Sink Mixer to kitchen. HPM switches and sockets in standard colours. Extractor fans to bathrooms. Smoke alarms, LED down lights. LED soffit lights to exterior. Rinnai 24ltr continuous flow natural gas or LPG, or Coopers 180ltr electric hot water cylinder. Panasonic CSCUE24LKR high wall heat pump (back to back install). 36 sqm of tiles at $50.00 inc GST per sqm. White tiles to bath cradle and surround. Fitted with white wire wardrobe organizers. Walk-in wardrobe fitted with two 400mm shelving units and hanging rails. Pine slats to linen, MDF shelves to store rooms. Casa Bella 4kg heavy duty carpet from Carpet Mill. At AJ Homes, we understand that a fixed price for your entire new home is important for a number of reasons. We can work with you to give you a final fixed price, but the below items are variable depending on your site. We can, however, organize these for you and provide you with the final figures. 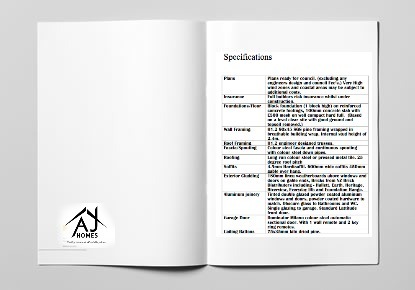 So what’s not included in our standard specification? Connections: No allowance made for connections from house to power, phone, gas, sewer or storm water. Driveway/Outdoor Concrete: No allowance made for driveway and outdoor concrete. Landscaping: No allowance made for landscaping. Window coverings: No allowance made for drapes and blinds.